Monday just gave me a knowing wink, then passed me a giant serving of this summer detox salad. I’m not sure who cued Mr. Monday into my Friday night bar bill, showed him the recycling bin after Saturday’s excursion on the lake (I promise I shared that six-pack and guac! ), or mentioned Sunday night’s barbecue bonanza (kudos to my sister-in-law, who cooked five pounds of fall-apart tender spare ribs), but he has a way of cajoling me into atoning for my weekend excesses. It’s as if the “M” on my calendar stands for “Make Amends.” On Mondays, I restore the equilibrium of my digestive system, and thanks to wonderful, nutrient-rich meals like this Super Summer Detox Salad, I feel happy and satisfied while completing the task. I created this salad the week after we returned from New York City, which if you’ve so much as skimmed that post, you might have an idea why I felt compelled to up my intake of greens. In the Big Apple, we ate with the guilt-free gusto of vacation, regretting only our lack of stomach space. Though I certainly wouldn’t trade the midnight pork buns, daily croissants, melt-in-your-mouth pastas, and fried chicken we enjoyed for a salad bar, I arrived home in a body crying out for a reset (and vegetables). I’ve long been suspicious of stereotypical juice-based detoxes (plus, I completely lack the will power to subsist on liquids alone), so instead, I created a filling meal based around antioxidant-rich foods. The result is a hearty salad loaded with texture, good-for-you-ingredients, and bursting with fresh summer flavor. 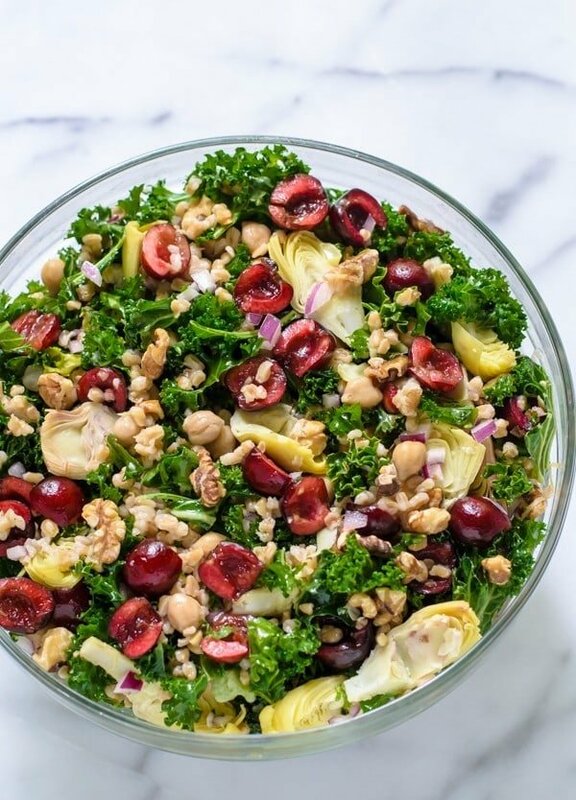 Let’s review our detox dream team: crunchy kale; bright cherries (strawberries, blueberries, raspberries, and grapes would be excellent too); walnuts; whole grains (I used farro—quinoa or brown rice are good swaps, if you prefer); artichokes; lemon; and chickpeas, plus red onions for a little zip. I can already feel the power. Packed with fiber and protein, this summer detox salad is satisfying enough to serve as a main meal and will keep in the refrigerator for four days, making it a perfect make-ahead dish. I actually thought it tasted even better leftover, after the kale had mellowed and softened a bit. In the event you need one more reason to toss together this detox salad, let it be the season. Once again, I’m joining the #EatSeasonal blogger team to share a round up of recipes highlighting produce that is at its peak of freshness and flavor. The June list is dreamy. 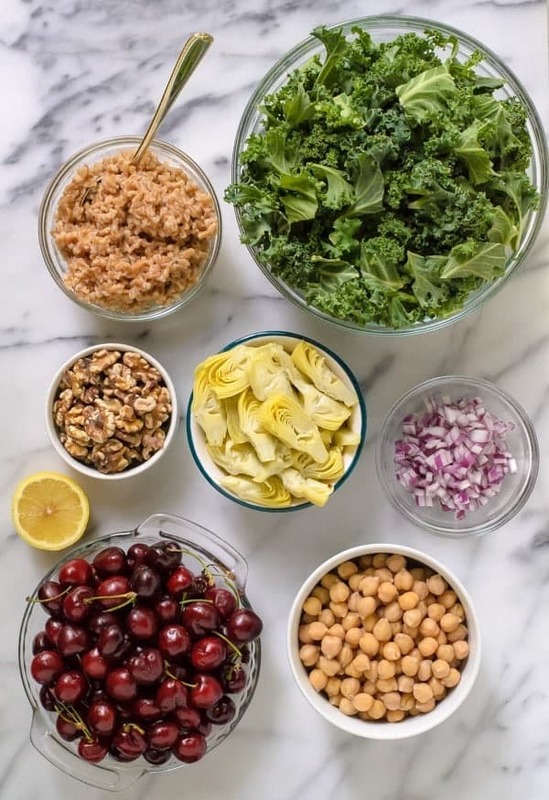 Honestly, I think I could make some version of this detox salad with just about every ingredient on this list, and I hope you feel inspired to do the same. Monday, give me all the knowing looks you like—I’ve got a forkful of summer detox salad, and I’ll dominate any stare down. 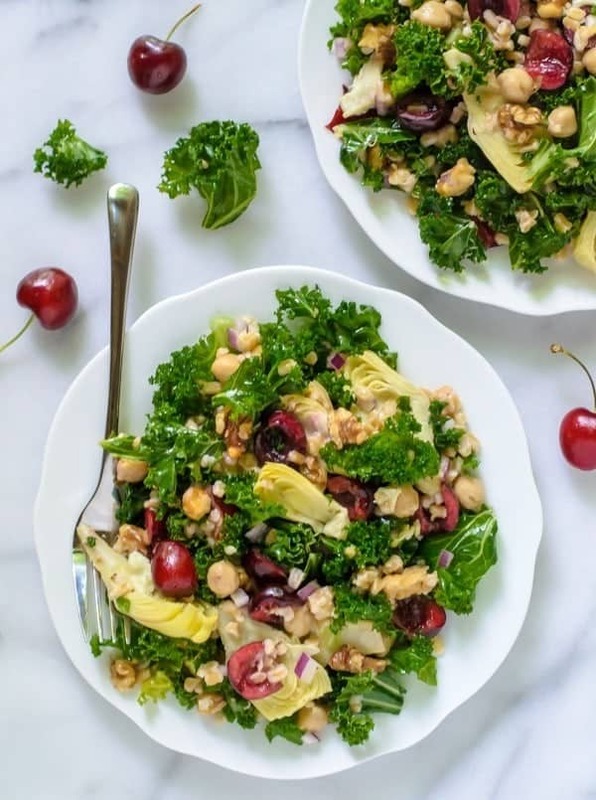 A healthy and filling detox salad loaded with antioxidant rich ingredients like kale, cherries, walnuts, and artichokes in a light lemon dressing. Place the farro in a medium saucepan with 1 1/2 cups water and 1/4 teaspoon salt. Bring to a boil, reduce heat, then simmer uncovered, stirring occasionally, until the water is absorbed and the farro is tender, about 25 minutes. Transfer to a large serving bowl. While the farro cooks, prepare the other ingredients. In a small bowl or measuring cup, briskly whisk together the olive oil, lemon juice, and 1/2 teaspoon salt until well combined. Pour over the warm farro, then toss to coat. 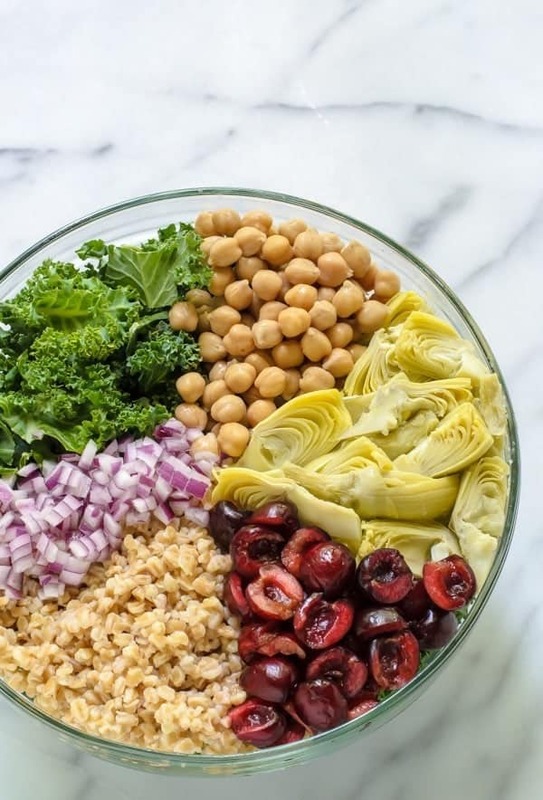 Add the kale, cherries, chickpeas, red onions, and artichokes and toss to combine. Sprinkle the walnuts over the top. If time allows, place in the refrigerator for 20 minutes to allow the kale to tenderize. Enjoy. Leftover Summer Detox Salad will keep in the refrigerator for up to four days. For more June inspiration, don’t miss the rest of our #EatSeasonal recipes, and tag your own social media seasonal recipe photos with hashtag #EatSeasonal too! I love grains added to salad they make it so much more substantial…and I just can’t get enough of cherries. they are at their prime right now and I’m eating them by the fistful, so adding them to a salad may slow my consumption down slightly…great salad. Sounds so fresh and delicious! Totally my kind of salad! I 100% need this. It seems that lately all I’ve been doing is stuffing my face with every unhealthy food imaginable (I blame vacation as well). This salad looks perfectly refreshing, perfectly filling and is perfect to get me back on track! Happy Monday! I get so excited for the seasonal produce posts each month. This detox salad looks perfect to keep my summer body goals going! Morning Erin, it’s a bit early for me love the looks and sounds if this salad. I can’t see on the ingredients kale, it’s in the pictures and you mention it in the instructions. Maybe I missed it? Mondays are so sneaky like that! I’ve been lacking salad inspiration lately so this is exactly what I need! I love, love, love everything about this salad! Hooray for cherries in salad! This looks like a hearty, healthy super delicious meal that I’d like to eat all summer long. This salad is mouthwateringly gorgeous (I say as I just finished a handful of malted milk balls, eeehhhh)! YUUUM that salad looks amazing!! So many different elements, just as a fun salad should be. Far from boring! In Russia there is no artichoke. What can replace it? Thank you. Hi Liudmila! 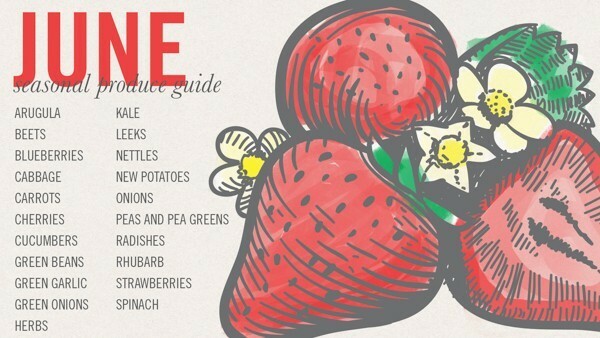 Feel free to use any other veggie you enjoy. Steamed chopped asparagus (or asparagus ribbons left raw), lightly sautéed zucchini, or lightly steamed broccoli would all be great! 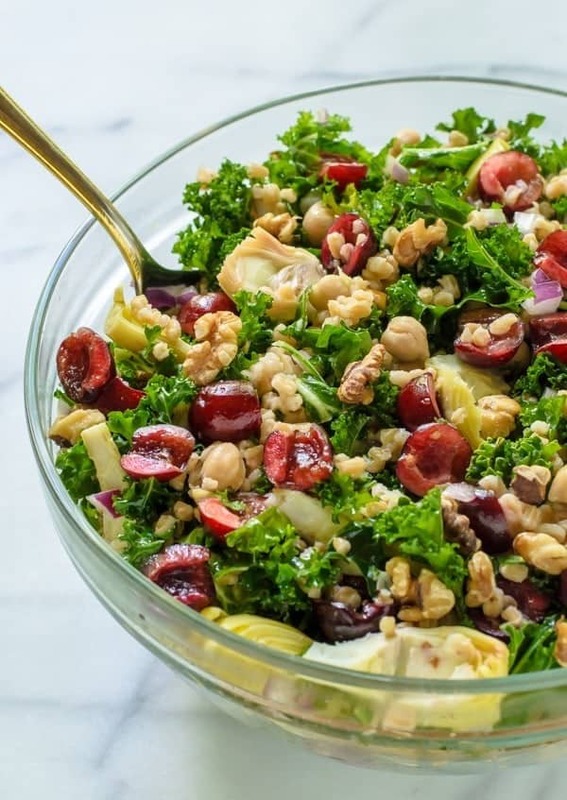 I love cherries and walnuts in this salad! That is not a combo I would have put together but now that I’m thinking of it, it looks AMAZING! And a fun use for farro which is such an over looked grain. Seriously amazing. This salad looks wonderful. I love the addition of the cherries! Perfect detox salad after a long weekend! I love all the delicious toppings you added to this salad! The cherries and walnuts in particular are a fantastic touch! Erin, I can’t remember if I’ve said this yet, but happy three years on the blog!!! I’ve had a serious obsession with cherries lately, and I can’t wait to make this. What a beautiful salad for summer! The cherries are a wonderfully yummy touch! I will be adding them to my salads more often. Thx for sharing. This salad is just what the doctored ordered. So healthy and delicious, Erin! I’ve never paired cherries with artichokes before but I am going to have to now! YUM! I have all of these ingredients in the fridge. I guess I know what I’m making for lunch tomorrow! You are my hero. I’m in a cleaning eating diet for the bikini ultimate goal. And to tell you the truth, i’m dying here with my poor, miserable diet. This brand new this is a lovely encouragement for me to embark on this challenged journey. Thank you so much!!! Hi Erin! this salad is absolutely gorgeous! But is the nutrition calculation correct? 600 cal per serving? Is that a main dish serving or a side serving? I hope its a side serving otherwise just one meal will be more than half of my calorie intake! Hi Fran! I don’t actually calculate calories for any of my recipes (you can read them here: http://www.wellplated.com/faqs/)— since the ingredients are filled with fiber, protein, and healthy fats, I felt good having it for a main dish. That said, everyone needs to do what works best for them and their diet! This sounds so yummy and guilt-free. I need a detox after a couple of weeks of travel and fast food. I bought the ingredients today. I can’t wait to try it! Hooray! I hope that you enjoy every bite, and I’d love to hear with you think. Thank you! It was delish! Very flavorful and it was indulgent without the guilt. I had pecans and quinoa already, so I used that instead of walnuts and farro. I’ll be making this every week for my meal prep so I can eat it out the fridge and it travels well. Maybe do little variations to keep it interesting. Thank you! I am just thrilled to hear this! Thank you so much for trying the recipe and letting me know. I’m making for lunch tomorrow! Thank you! I have really enjoyed reading your story. My husband and I are trying to do the no sugar eating. My husband is a diabetic , he is doing great. I am going to get on board, l have fibromyalgia and I know I would feel much better. This has really encourage me. Keep us posted with new ideas. God Bless You!!! Sherry, thank you so much for this kind and encouraging note. It was definitely an incredibly positive experience for me, and I hope it is for you too. Wishing you all the best on this journey! This looks amazing! I’m allergic to chick peas though. What would you suggest for a happy alternative? Cindy, you can really sub any kind of protein you like! White beans (such as cannellini or white kidney) would be great, as would grilled chicken or sautéed tofu. I hope you enjoy the recipe! This was delicious! I swapped out a few things(cannelinis for chickpeas and craisins for cherries)because it was what I had on hand. The dressing seemed overpowering by itself but was great once it was on the salad. It was even better the next day! Thank you for this salad recipe. I made it with quinoa, and followed the recipe exactly – it was delicious. In fact, my husband asked me to make it again (and he is a burger kind of guy). The second time, I made it with a chopped avocado instead of the canned artichoke because I had all of the other ingredients and didn’t want to run to the store for just artichokes. It was also delicious that way. I agree it is even better the second day. You should rename it awesome salad, as the detox properties are terrific, but the flavors stand up to any other salad I have made. Tip: make double the quinoa amount and save it in the refrigerator to shorten the prep time when you make it again. Janie, thank you so much for this glowing review, and your tip about the quinoa too. Avocado sounds like a delicious addition as well. I’m going to try it that way myself next time! Looks great!! Is this 4-6 servings as a side or a main dish? Thank you! Hi Amber, it really depends, which is why I gave a range. It will probably serve closer to 4 as a main dish and more like 6 people as a side, but that depends on how hungry everyone is! Just made this tonight, Jeff said it’s his new favorite! Definitely worth trying to pit the cherries- I need to find an easier way for this part. Do you have a cherry pitter? It is a LIFESAVER! I’m so so happy you both enjoyed it Jana. Thanks for letting me know how it turned out! I’m sure that would be tasty Tracey! The arugula will have a much more peppery taste so it will change the flavor profile somewhat, but if you like arugula, then I’m sure you’d enjoy that. The arugula also won’t last as long in the refrigerator as kale once it’s mixed in (it wilts more quickly once it has dressing on it), so if you’d like leftovers, you might consider waiting to stir into the arugula only into the portion you are planning to eat right away. What type of nut would substitute best? I’m allergic to walnuts so I was thinking maybe pecans or almonds. Just curious if anyone had tried switching that up. Thanks! Melissa, I think either would be delicious, truly! Personally, I think I’d go for pecans with this flavor combo, but you really can’t go wrong. Thank you so much for the reply Erin! Made tonigh using pecans (and kale just picked from my garden) and it’s so GOOD! WHOOO HOOO! Glad to hear it Melissa, thanks!